Victoria HarbourCats | HarbourCats to Give Away a Funeral - Again! 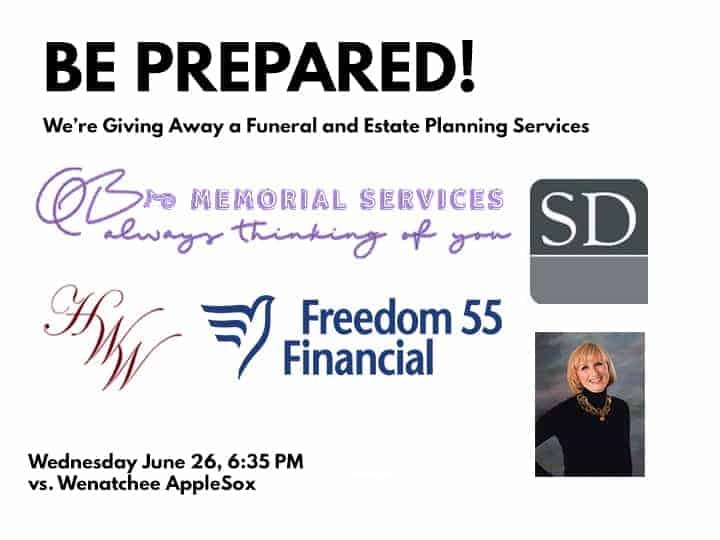 Victoria HarbourCats | HarbourCats to Give Away a Funeral - Again! VICTORIA, B.C. – It’s inevitable for us all, so let’s talk about it, and prepare. The Victoria HarbourCats, heading toward their seventh season, are returning with their all-time most-talked-about prize package, which made its debut last summer. The West Coast League team is giving away an End of Life package that includes a will, investment/insurance advice, and, yes, a funeral. As someone said last summer – it’s the last prize you ever have to win. People were dying to go to the game, it was remarked. The promotional giveaway game garnered national and international media interest. The date this year – Wednesday, June 26, when the Wenatchee AppleSox are at Wilson’s Group Stadium at RAP for a 6:35pm game. To be eligible, fans attending the game must purchase a game-day program and fill in the prize ballot and deposit it in the prize box at our Information Booth. All entries in the prize box are then eligible to be drawn as the winner. Last year’s winner, Travis H., works as a driller-blaster – and he celebrated when his name was drawn. Every single day, he places himself in harm’s way, concerned first and foremost about his safety while supporting his family. The HarbourCats are pleased to team with Qualicum Beach Memorial Services, who serve the Island thanks to Bev Walkey and Eric Toneff, and H.W. Wallace Cremation Service, with a base funeral and cremation package. This package is valued at more than $5,000. As part of this, MARY S. McMANUS, a barrister/solicitor with the Stevenson Doell Law Corporation of Victoria, will provide a Will, Power of Attorney and Advanced Directive for Health Care — worth $800 (excluding taxes and disbursements), helping the winner ensure their family is looked after for those days we all will eventually encounter. Mike Reilly, Freedom 55 Financial Officer and a long-time HarbourCats supporter, will provide a comprehensive and complimentary Retirement or Estate Plan, assessing all the aspects of insurance, financial goals, wealth management, valued at $500. Reilly will donate the first $500 of any further commissions from this to the HarbourCats Foundation as well.